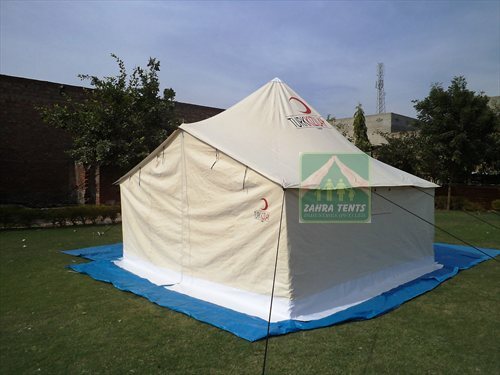 Zahra Tents Industries (Pvt) Ltd.
Material Outer Tent: Single fold of 400 g/m2 water proof and fire proof & UV treated poly cotton canvas. Inner Tent: Single fold of 250 g/m2 water proof and fire proof & UV treated poly cotton canvas. Frame Made of painted steel poles:- 1 Center standing pole of 48 mm. dia and , 2 Doors standing poles of 33 mm dia , and 8 wall poles of 20 mm dia. Ground Sheet Bathtub ground sheet , made up of 180 g/m2 High Density polyethylene fabric coated on both sides with low density polyethylene fabric coated on both sides with low density polyethylene (HDPE) . Mud Flap Made of white fabric , 180 g/me -15 cm on wall & 20 cm as Mud Flap. Accessories All required tools and accessories for ready use .1 hammer of 1.5 kg, 14 steel pegs and 16 steel pins & assembly instruction. Packing Each tent packed with all accessories in one rolled bale and forms one bundle. outer /Inner tent rolled with all accessories and poles, where accessories were packed in separate hdpe bag and poles were separately packed in hdpe bag inside the bundle.